We produce for Italy and abroad chocolate moulds travels and souvenirs from the world. 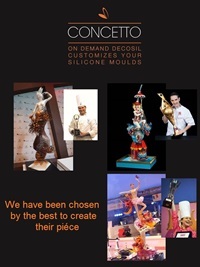 Italian leaders of silicone moulds, we create and sell for over 10 years chocolate moulds travels and souvenirs from the world, food safe silicone moulds worldwide to confectioners, bakeries and Delicatessens. Silicone chocolate moulds inspired by travels, monuments and souvenirs from all over the world. Why do we propose this new line of moulds dedicated to souvenirs? The silicone moulds designed for chocolate souvenirs to be given to friends and relatives when you come back from a trip is a new idea by decosil 2017. You may often have found it difficult to choose the right present to be brought with you on your trip back or you may have felt embarrassed in receiving it while thinking, "were can I put it?". We have thought the winning idea is to give you the chance to donate a chocolate souvenir. A souvenir-shaped object, which should not be a useless decoration for you to remove the dust. It should instead become a sweet souvenir to share at table. Every place in the world has its own features. the windmill and the wooden clogs for the Netherlands and moulds of items recalling Las Vegas Casinos, the lighthouse you can find in any seaside location. Italy is the "Bel Paese" (Beautiful Country) and any town of ours boats countless famous historical monuments and artworks. That is why we make it possible for our customers, thanks to our certified food-contact grade silicone mould, to produce and display chocolate objects attracting the tourist as well. In this way, today, the pastry chefs sell typical Italian artisanal special chocolate cakes and sweets which attract there customers thanks to their shape. CONCETTO is a package service which decosil makes available and it is designed for the production of customised moulds as to shape and size. In this way you can obtain objects not yet included in our catalogue.